A medium-sized white dog with the ‘smiling’ face, the Samoyed was brought out of Siberia at the end of the last century and the early part of this century to pull sledges on Arctic and Antarctic expeditions. These valiant dogs endured terrible hardships serving man in his quest for the Poles, with only a few returning. The Samoyed was originally used to hunt, herd reindeer, and haul sledges for the Samoyed people in the northwest of Siberia. The Samoyed tribesmen were peaceful nomads who demonstrated extraordinary love for their beautiful dogs and treated them as members of the family, and so their dogs developed a love and understanding of man. Samoyeds can live up to 12 years of age. Despite its arctic heritage, the Samoyed has adapted well to warmer climates. It can sleep outside, although it certainly prefers to sleep inside, and needs to spend a significant part of each day being a loved part of the family, at the centre of everything you do. 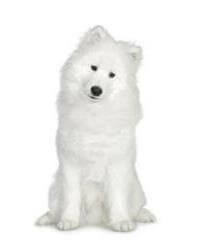 Samoyed fanciers find this zealous participation in the whole of their lives to be the breed's greatest asset. A Samoyed is an active dog, being inquisitive, quick witted, and mischievous. Excellent if brought up around other animals. If you purchase an adult, please let the breeder know what pets you have at home and check if the dog is suitable to go into that environment. The breed's magnificent white coat has two layers, a dense, woolly undercoat that is typically shed once a year, and a silver-tipped harsh outer coat of long, straight guard hairs. Grooming this lovely coat can be a pleasure, or a chore, for both dog and owner. A family with very young children should consider a female, whereas a dog is likely to be more suited to the rough and tumble of older children and teenagers.